Trying new things doesn’t always pay off (hello, bangs), but Instagram has made it easier than ever to get results from their shiny new offerings. With new features and updates announced so frequently, the possibilities on Instagram seem endless. But, this can get tricky for social media marketers who want to make sure they’re spending time and budget on features that actually drive results. In this post we’ll outline seven Instagram features that are worth trying in 2019. Users first noticed the addition of a countdown sticker for Instagram Stories in December 2018. Since then it’s been used by brands in tons of creative and clever ways. 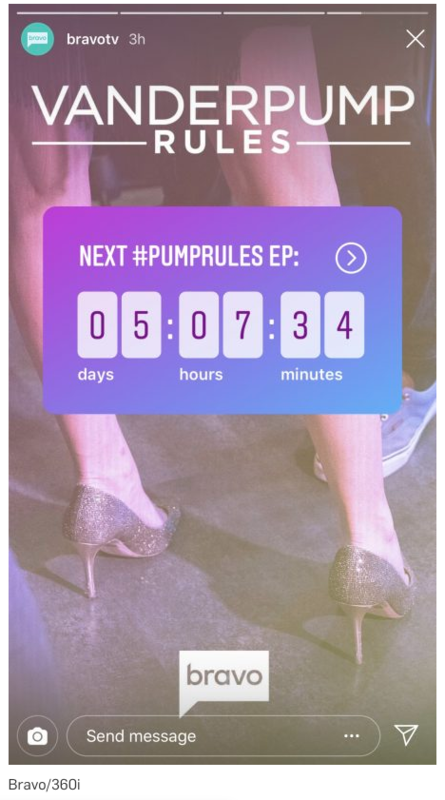 For example, BravoTV used a Countdown sticker to get their audience excited about a new episode of their hit show VanderPump Rules. The Countdown sticker is available in your Instagram Story deck, near GIFs and Polls. Once you add the sticker to a Story, you can customize it with a title (such as “New store launch” or “Mid-season sale”) and set your end date and time. The best part of the Countdown sticker? Your followers can tap to either set a reminder and receive an alert when your countdown ends, or share it with their followers. This is as close to actually setting a branded reminder in their phones as you can get. Augmented reality (AR) is a buzzword we’re hearing a lot about lately, and your brand can stay on-trend with an Instagram branded filter. That’s right—the cute puppy filter you’ve been using on Instagram is actually a version of AR. Through Instagram’s closed beta program, select brands are able to create their own custom AR filters for Instagram stories. As users must be following a brand to have access to the custom filter, this is the perfect way to not only gain new followers, but engage your existing community. An example of how brands can use these customized filter is the streetwear brand Off-White. 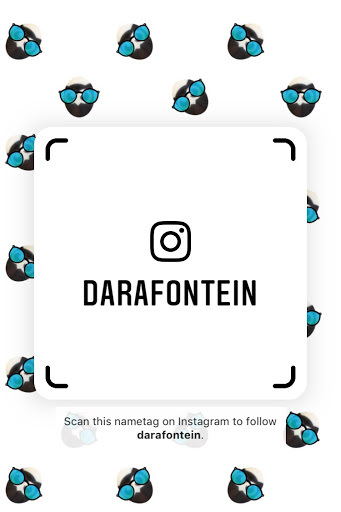 They launched a fun sunglasses filter to help promote their upcoming show at Paris Fashion Week, allowing users who visited their page to try on different styles from their collection. While this feature is still currently in the closed-beta phase available to select third parties, it’s a good time for your brand to consider whether custom AR filters are a fit for your business—and start brainstorming engaging ideas. More than 400 million people use Instagram Stories every day, meaning they’re the perfect place to advertise your business. One-third of the most viewed Stories actually come from businesses—and one in five Stories results in a Direct Message from the viewer. If you still need convincing, check out this example from publishing powerhouse Condé Nast. They saw 20 percent of the total paid social subscription volume come through Instagram Stories Ads used to drive sales for their iconic September issue. They also saw a 77 percent higher click-through rate than ads placed elsewhere, and a 20 percent lower cost-per-acquisition. Pay attention to your top-performing organic content and redesign it for Stories Ads. Look at what content from your feed is engaging your audience the most, and use the creative for Ads. There’s a reason people are paying attention! Include an enticing call-to-action button. 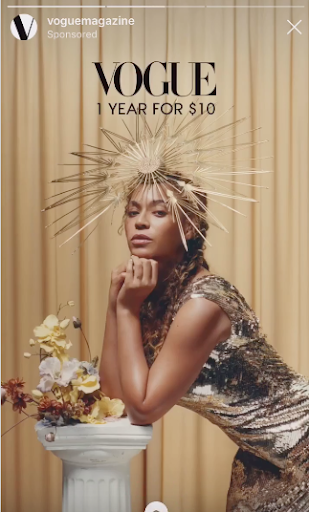 Each Conde Nast ad had a subscribe button that, when swiped up, led to a special offer on the Vogue subscription page. Whether you want to drive people to your website, a specific product, or an event, make it as easy as possible for them to get there. When it comes to growing your business, it’s important to look for ways to incorporate offline tactics alongside your digital strategy. If you have a bricks-and-mortar location, add a feature wall, backdrop, or other interesting interior design elements into your business. Make sure you have a recognizable and relevant hashtag and encourage customers to take photos and share them on Instagram for an easy way to gather user-generated content featuring your space. One business that has done this perfectly is Mr. Holmes Bakehouse in San Francisco. While planning a trip to the city last year, I kept seeing the same pink neon sign pop up on Instagram. How can you create an Instagram-worthy business? Add a feature wall or backdrop. Check out popular businesses in your area and look at their tagged posts to see the kinds of things customers are focusing on, or search Pinterest for great ideas that don’t cost a lot of money. Use aesthetically pleasing packaging. If you’re a cafe or restaurant, make sure your napkins, cups, and to-go containers are branded with your business’ logo or another appealing, instantly-recognized symbol. Mr.Holmes’ Bakehouse also does this well. Their to-go bags are labelled “Health Food” in the business’ iconic pink font, and their pastry boxes donning the same “I got baked in San Francisco” message as their famous sign. Spruce up the exterior of your business. The outside of your business gives customers their first impression, so make sure it’s photo-worthy. Our own Hootsuite office in Vancouver became a work of art when artist Scott Sueme painted it for the Vancouver Mural Festival. 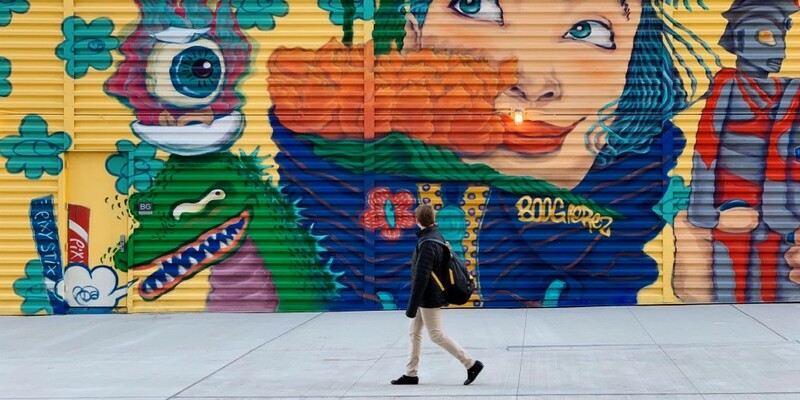 Whether adding a new coat of paint, new plants and flowers, or a full-on mural transformation, delight your customers from first sight. 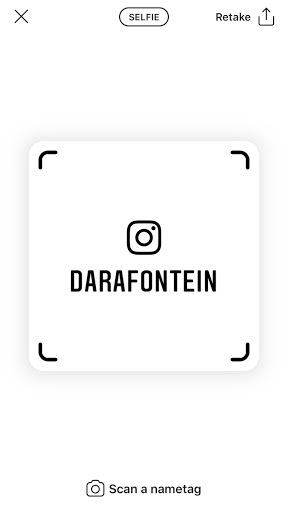 If you’ve ever tried to find somebody’s Instagram account after a networking event (or first date) and had no luck, only to discover they’re under some random username, you’ll love Instagram’s Nametag feature. Introduced in October 2018, Instagram Nametags make it easier than ever for you to find specific users—and to get others to follow you. To see and customize your own Instagram Nametag, go to your profile and click on the menu (the three lines). You’ll see the Nametag option under the ‘Your Activity’ button. From here, you can either scan a Nametag, or customize your own Nametag. Customize your nametag by clicking on the top button to select either a color background, emoji background, or selfie background. If you are a brand, I suggest you take a photo of your logo in the selfie option to create a tiled background. Once your nametag is customized, it’s ready to be shared. 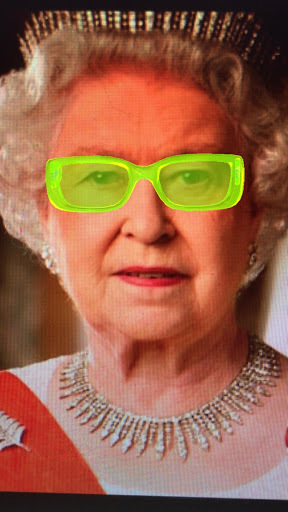 Click on the arrow in the top right hand corner to save the image or send to others. As a business, you can include your Instagram nametag on promotional materials, in your email signature, on your website, and anywhere else you want your customers to find you. They’ll simply have to open Instagram or their phone’s camera to scan the nametag and start following you, which lets them start liking and commenting on your posts as quickly as possible. In November 2018, Instagram introduced two new improvements for the visually impaired. The second new feature is custom alternative text so users can add a more-detailed description of posts when you upload a photo. In addition to features for the visually-impaired, many users are now captioning their Instagram Stories and video content for those who are hard of hearing and deaf. New York Congresswoman Alexandria Ocasio-Cortez brought attention to this with her November 2018 Twitter post. She reveals that members of the deaf community reached out to her, and now she uses tools such as Clipomatic to caption all of her video content. How can your business make your Instagram content more accessible in 2019? Make sure you’re adding alternative text descriptions to your Instagram posts. When posting a photo, click on ‘Advanced Settings’ and type in a description that will allow all of your followers to experience your content. Add captions to your video content when possible. Captions don’t only boost accessibility, but can increase viewership. Facebook found that more than 85 percent of Facebook video is watched without sound, regardless of the audience’s hearing abilities. Making content more accessible benefits everyone. Sometimes you don’t need your in-laws viewing your latest Instagram Story. Or, if you’re a business, you have content that you know would be perfect for certain customers but won’t engage others. This is where your Instagram close friends list comes in handy. The Close Friends list allows you to share Instagram Stories with a specific group of people. You can add and remove users from this list whenever you want, and customize it depending on what you’re using it for. Don’t worry—users won’t be notified when they’re added or removed from your close friends list. To create your Close Friends list on Instagram, go to the menu bar on your profile. Tap “Close Friends” and then tap “Add” next to the usernames of the people you want to add to the list. Click “Done” when you’ve finished adding users. How can your business use a Close Friends list on Instagram? Exclusive content. Create a list of VIP members who you only show specific content to. For example, you could provide early access to new products or features of your product to a select group of customers. Influencers. Create a close friends list consisting of influencers you work with (or want to work with) and share information they can use to help grow your brand. Instead of having to email each influencer separately, having a close friends list will save you tons of time here. Localization. If you have multiple offices or store locations, you can create a close friends list for a particular geographic area. For example, if your store in New York is having a sale or event you can create a list of users or influencers you know from that location and share a Story with them—without bothering those who aren’t close-by. While it’s easy to get stuck in a rut when it comes to your Instagram content, these new features and capabilities can give your 2019 strategy a total refresh. Let us know what new things you’re looking most forward to trying on Instagram this year!